Halloween is one of my favorite holidays specifically because I don’t have to be myself. It gets tiring being yourself day in and day out. Why be myself if I can be Batman? Okay, maybe I can’t be Batman, but until that day comes I welcome Halloween with open arms. Scary at its roots, I find it to be a silly sort of holiday. Clearly, I was in some sort of mood as I decided to dress in fashion of a Mad Scientist and go to town on making a video. I’ve come to the realization of 2 things today while shooting and editing this video. I really need to make space on my phone. The amount of apps I deleted during the shooting today and still got interrupted with the “no more storage” vicious warning screen is absolute nonsense. I may be too cheesy to be on film. On the plus side, I do love cheese. If you’re looking for a tasty treat this Halloween, look no further. 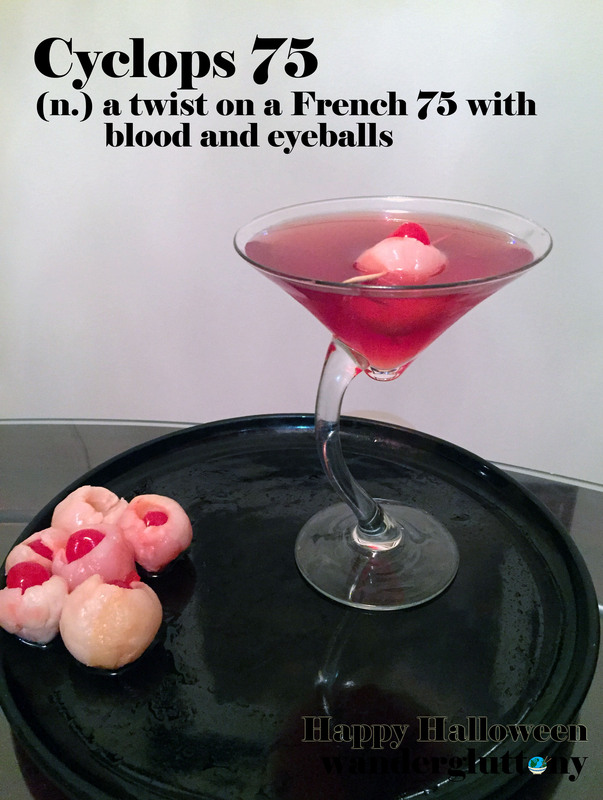 The eyeballs for the garnish of this cocktail were first brought to life by my father who brought a cauldron full of gawking punch. They were a hit with the family and the workplace, but ever since I’ve been thinking of a way to adultify it. And let me tell you, this stuff is gooood. 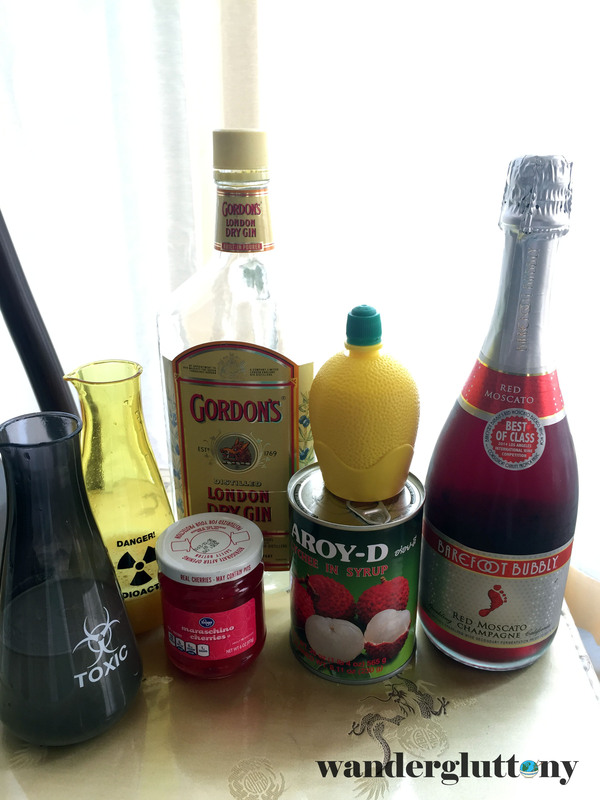 A play on the French 75, I introduce the Cyclops 75! Read on for the recipe to accompany the video. 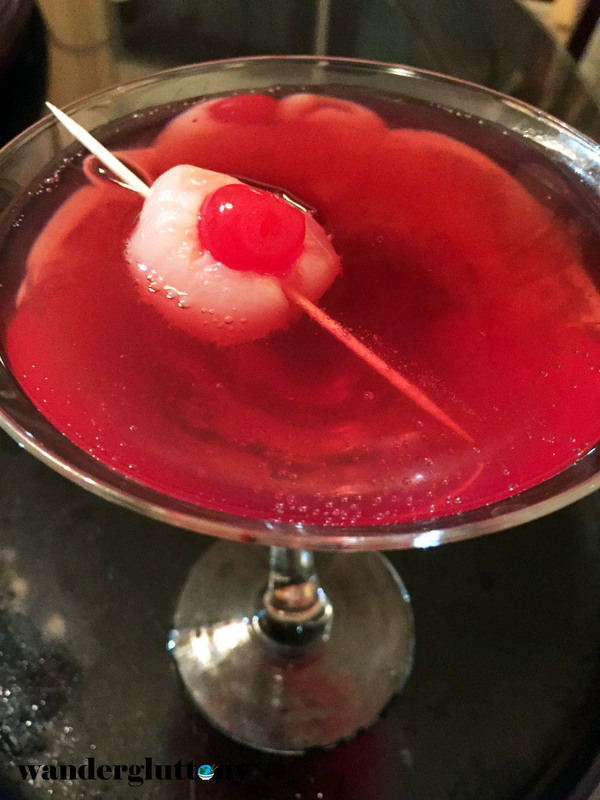 Prepare garnish by stuffing maraschino into a pitted lychee. In an ice filled shaker build gin, lemon juice, and syrup. Shake well to combine. Strain into martini glass. Enjoy your treat with a little trick! Thank you it definitely is! Eww but super fun! I just might try this at a Halloween party I’m going to. Let me know if you do! I’d love to see what more people think of it. Those eyeballs!! I would probably scream if I saw those! Awesome idea! Haha thank you! They are super spooky!